The Crabby Cook – Jessica Harper» Blog Archive » Valentine’s Day Gift: Custom Bobble Head or Chocolate Truffles? Valentine’s Day Gift: Custom Bobble Head or Chocolate Truffles? I was pretty impressed when I cruised one list of Top Valentine’s Day Gifts For Men. But after careful consideration, I decided to go a more traditional route. See, while the Pickle-of-the-Month gift idea had a certain appeal (pickles are one of Tom’s favorite food groups), when I imagined sitting down to a candlelight dinner on 2/14 and handing him this month’s selection, it just seemed like a buzz kill. Another top pick was the Ultimate Stock Car Ride-Along. The giftee gets to ride shotgun, at 150 mph, in a stock car race, with a “professional” driver at the wheel. Now, call me a softie, but I decided I didn’t think it was friendly to gift my husband with an activity that would almost certainly result in his death. 1. Place the chocolate in a medium bowl. Pour the cream into a small saucepan and heat it over medium heat just until it starts to boil. Pour it over the chocolate and let it sit for a few minutes, until the chocolate is melted. Stir the mixture until it’s smooth. (If the chocolate is not completely melted, you can microwave it on high for about 15 seconds.) Stir in the vanilla. Set the mixture aside to cool, then cover and refrigerate it for an hour, or overnight if you prefer. 2. Meanwhile, grind the almonds in your food processor until finely ground. 3. Using a melon ball scoop or a spoon, scoop the chocolate and form it into balls, about the size of a small melon ball. Roll each ball in the ground almonds to coat them on all sides. Cover and refrigerate the finished truffles until you are ready to serve them. They will keep for several days in the refrigerator, or you can freeze them. : Add a tablespoon or two of Cognac or Grand Marnier instead of the vanilla. 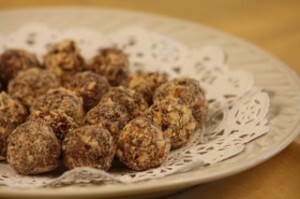 Instead of the almonds, roll the truffles in confectioner’s sugar, unsweetened cocoa powder or ground pistachios or hazelnuts. This entry was posted on Friday, February 11th, 2011 at 1:59 pm	and is filed under Cool Products, Just Desserts. You can follow any responses to this entry through the RSS 2.0 feed. You can leave a response, or trackback from your own site. Truffles were a great choice. Although now I am curious about the romance book. Sexist – ROFL.